The governor Kaduna State threatened to send back the foreign election observers from, USA, EU, Russia, Israel, Germany, France and Africans, back to their respective countries in body bags! Today the Christian dominated Southern Kaduna is almost extinct by the demonically volatile Fulani herdsmen. Where is Zamany Likwot? Where is Rev Father Hassan Kukkah? Where are the World leaders to save these races being killed in their numbers, including their children, women and jaded old men? The obvious fact is that Genocide is rife in Nigeria. Lawlessness is reigning supreme in this part of the World. Might is right in APC and Buhari government. Election rigging has become a norm in the former British colony. Fathers, mothers and bread winners are mercilessly murdered in Rivers State polling booths just to announce false election results. In fact, it will pay the Biafrans to have the timely intervention of the World Communities to allow Biafrans a democratically organised BIAFREXIT referendum than to rushing aid materials to us in time of wars. 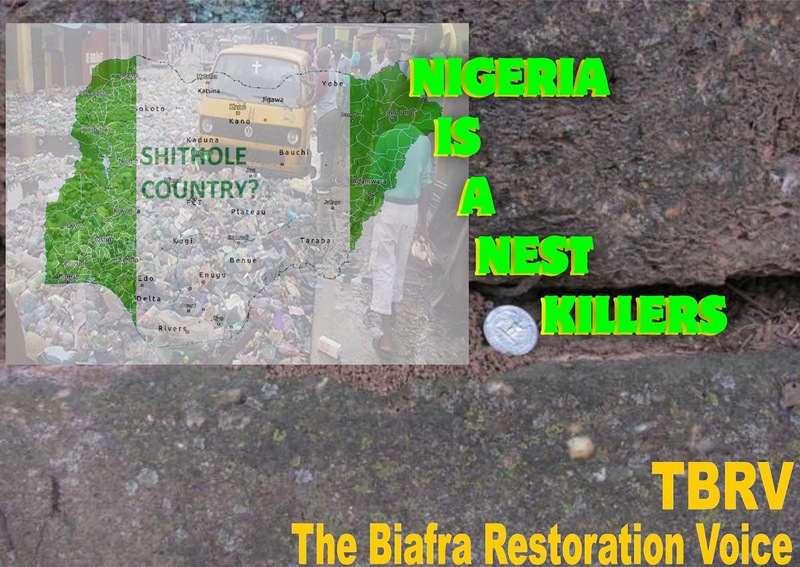 Evidently, Nigeria is a failed state and there is no antidote that can save the imminent socio-political cataclysm that is at the doorstep of this British amalgamated contraption. Citizens are giving on daily basis; all hope is lost. Young men and women are dying in robbery as a result of scarcity of job. The United Nations should desist from playing the Ostrich because the mountainous heaps of dead bodies of children, women and fatigued soldiers are in the social media for the World to see and empathise. Nigerian journalists have been cowed and bribed to christen the outright genocidal invasions and ethnic cleansing deliberately skewed against the poor farmers in Benue State, Biafraland as "FARMERS HERDERS CLASH". A journalistic abomination! How can a harmless poor farmer clash with Fulani herdsmen equipped with AK 47 that are invading his village at the wee hours of the night? Are the little children between the ages of two to nine years, whose necks are hacked with terribly sharp axes, clashing with the invading Janjaweed offsprings of Uthman Danfodio? Are the sucklings whose mothers are beheaded and their abdomens ripped open for the fowls of the air to feast on, clashing with herders who has become the special anointed ones of Fulani Government? You dare not fight back and, within a second, armies and police will come and arrest for taking the laws into your hands! If the AU, US, EU, Russia, Israel, Germany, France, ECOWAS and even Britain want to help out, the time is now. It is only a democratically elected government with good governance, obedience to court orders and rule of laws that can guarantee equity, fair play, security, shelter and dignity of man! This government trying to bestrode the saddles for the next four years is a terrible hoax and a hugely rigged in bandits! World peace will continually be a mirage in this part of the globe as far as Buhari administration is concerned. United Nations please, stop punishing the innocent Biafrans who have fought for their independence for more than fifty years! The UN and the World leaders are most unfair to Biafrans. Give us our Biafrexit Referendum. Lovers of freedom should please say enough is enough to the Nigerian entity that is fast progressing in error as the World greatest nest of mindless killers!! !